Cap up to 15 cm, at first hemispherical, later convex to flat-convex, smooth or slightly viscid in wet weather, yellowish ochraceous, yellowish brown, orange brown, pale brown, brown or dark brown, often irregularly spotted. 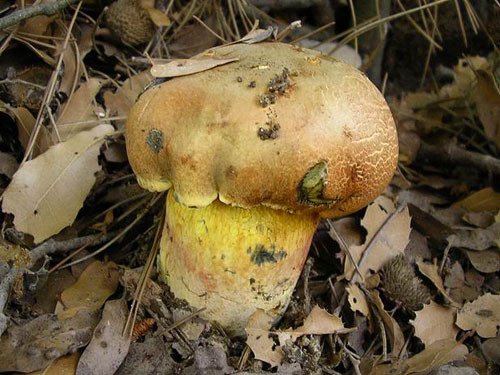 Stipe club-shaped, swollen or cylindrical, often rooting, in the upper part most often cream or pale to bright yellow, downwards reddish brown to rusty, sometimes entirely yellow or brownish, with more or less developed yellow to reddish brown, brown or rusty network, stipe surface blueing after handling. 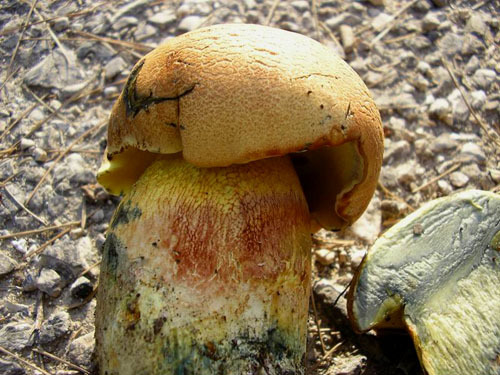 Flesh initially lemon yellow, later whitish in the cap and pale lemon yellow in the stipe, blueing when exposed to air. Tubes initially lemon yellow, then yellow with olivaceous tint, blueing when injured. Pores yellow, often developing somewhat rusty tint with age, blueing when bruised. Smell strong and persistent, somewhat of fermenting fruits. Taste not distinctive. 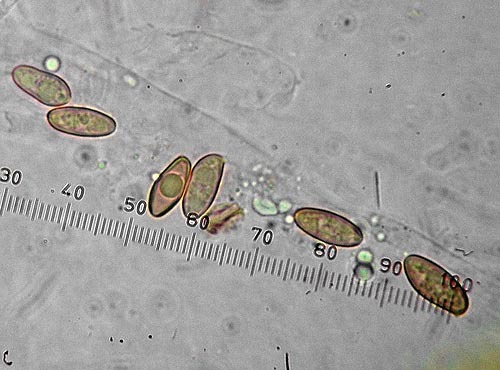 Spores 11–13.5 × 4.5–5.5 μm, ratio 2.2–2.7. 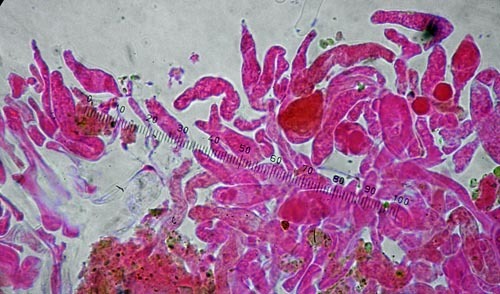 Pileipellis (the cap cuticle) trichodermium of interwoven septate hyphae of cylindrical, finely incrusted cells. Habitat. Broadleaf and coniferous forests in the Mediterranean, mycorrhizal with oaks (Quercus) or pines (Pinus). Distribution. In Europe known only in the Mediterranean area – France, Greece, Italy, Portugal, Spain (incl. Balearic Islands). In east reaches as far as Israel. Similarity. 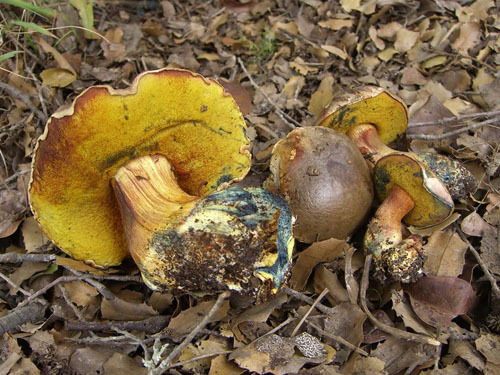 Compare with Boletus luridus which has differently coloured cap, red pores and orange, red to vinaceous (not yellow) flesh under the tubes. See also Boletus torosus. Boix, S., Moisés, J., Llistosella, J. & Llorens van Waveren, L. 2011. 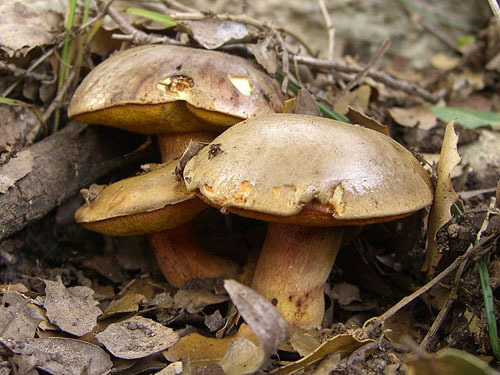 Boletus poikilochromus Pöder, Cetto & Zuccher., una rara espècie mediterrània trobada a Catalunya. – Revista Catalana de Micologia 33: 95–99. Calonge, F.D. & Redeuilh, G. 2000. 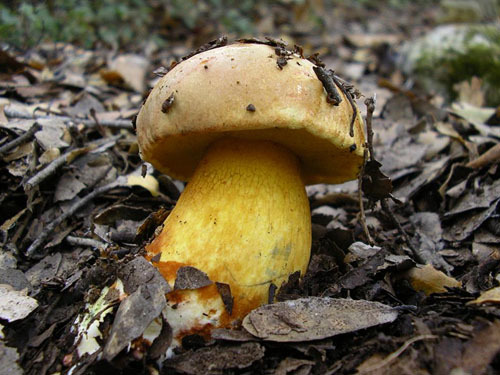 Boletus poikilochromus Pöder, Cetto & Zuccherelli, una especie mediterranea hallada por primera vez en España. – Boletín de la Sociedad Micológica de Madrid 25: 277–280. Cetto, B. 1983. I Funghi dal Vero. Arti Grafiche Saturnia, Trento. Pöder, R. 1987. Eine neue Boletus-art aus der Sektion Luridi: Boletus poikilochromus sp. 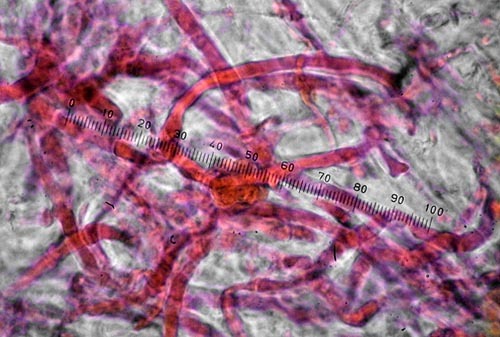 n. – Mycologia Helvetica 2: 155–163.